Digital Fabric began as a way to explore the materiality of the physical world in a digital space. The textile-based interface is comprised of an interactive surface that sits atop an ergonomically designed frame. 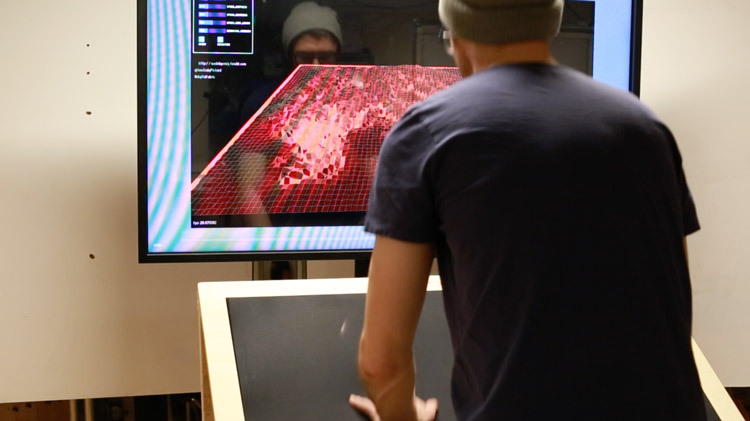 The interactive surface is nothing more than a piece of black spandex fabric stretched over a wooden frame. The application was written in Processing, and was heavily inspired by @p5aholic's spring-wave. The user is able to interact with the piece of digital fabric by manipulating the physical fabric interface. In much the same way that a piece of fabric is woven from elasticized fibres, the digital fabric connects a two-dimensional grid of nodes using computational springs. A graphical user interface built-into the program allows me to change the properties of these springs and thus influence the behavior of the digital fabric. The Kinect sits perpendicularly beneath the fabric and reads the change in distance between the sensor and fabric as the user makes an impression with his or her hands. This data is fed into the application and is used to apply computational forces to the digital fabric nodes.